The 60 inch quality breathable clothing storage bag by Hangerworld a trusted British brand is idea to keep and transport all you suits, dresses and gowns. The breathable cotton like material makes these bags strong but also flexible which is idea for folding for traveling and storage. The lining is acid free so won't damage your clothes and is also moth resistant. The extra long 60 Inch length makes these garment bags idea for long dresses or gowns but will also hold your suit with plenty of room. The suit garment bag features a shaped shoulders with a reinforced hanger opening, a top loop and lower eyelet for carrying and storing. A clear document folder will help you identify your garment if you have more than one. This bag is spacious enough to hold several garments like your suit and shirts or choices of dresses. The front full length branded zipper makes for easy access to your clothes and ensures when closed are fully protected by the bag. A secret pocket inside allows you to put in your outfit accessories including cufflinks, lingerie and valuables all together and out of sight. The Hangerworld suit / dress garment bag will keep your outfits clean, protected and ready for when you need to wear them next and you can buy with confidence from Hangerworld a trusted British brand. 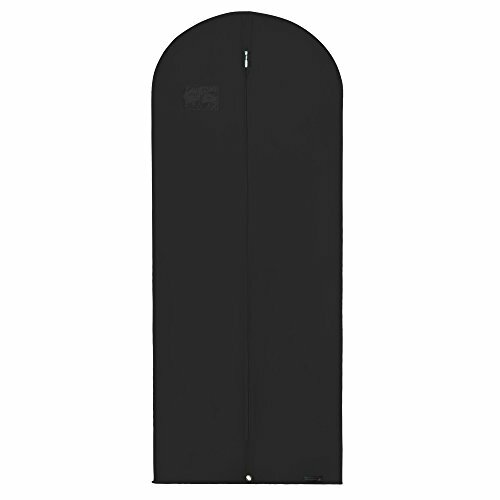 Quality suit garment bag measuring an extra long 60" x 24" (152cm x 61cm) approx. Ideal for long dresses and gowns. Full frontal zip with secret internal zipped pocket - for keeping valuables, mobile, jewellery, and lingerie together with your outfit and out of sight! Garmet clothing bag also comes with a clear transparent window to allow you to quickly identify your piece of clothing. Trusted Hangerworld British Brand covers with branded zip & trademarked sewn in tag - Made with acid free (PH neutral) and moth resistant material making it safe for use with all fabrics. If you have any questions about this product by HANGERWORLD, contact us by completing and submitting the form below. If you are looking for a specif part number, please include it with your message.